Evo & Grace: The WanderLusts: The Enchantment tale continues in Beauty and the Beast. The Enchantment tale continues in Beauty and the Beast. The golden anniversary continues as REPertory Philippines Theater For Young Audiences and the City of Makati brings back, after its successful 2003 run, the magic and classic tale " Beauty And The Beast " on its 80th season. This version was specifically tailored for young children with book written by Peter del Valle and John Ahearn, music by Michael Valenti and lyrics by Elsa Rael. 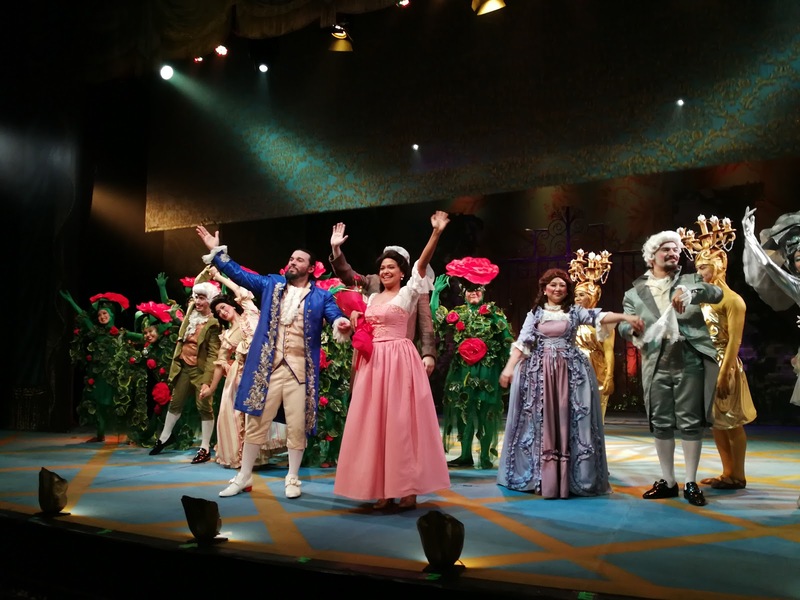 The magic storytelling and the classic retelling of this tale was based on the French novel of the same title published in 1740, goes live onstage with the direction of Joy Virata, Founder and Artistic Director of REP Theater For Young Audiences (RTYA) in celebration of its silver anniversary. Upon entering the house spectators will be greeted by a period proscenium size painted backdrop designed by Joey Mendoza. Amusing and amazing to see the human depiction of the rose garden through singing and dancing, designed by Bonsai Cielo Virata. It may not be the Disney version in terms of music, lyrics and tunes that I know, this one made me feel young at heart again especially when Cara Barredo (Beauty) and George Schulze (Beast) invited the house to sing with them. The story begins with the Father took a shelter from the storm at the garden full of red roses. Enchanted by the beautiful rose, he picked it as a gift to his daughter Beauty. Not knowing that place was in dark spell, the Beast consumed in his castle demanded that Beauty should stay in his castle in exchange of the rose. Upon his return home, he confessed to his three daughters the deal he made with the Beast. With her pure heart and selflessness, Beauty agreed to live in the castle, but with strong hesitation from his father and two sisters. It was through Beauty that the casted spell was broken because of true love. Barredo playing the role of Beauty was such a beauty and pitch perfect. A convincing and moving class act onstage. Schulze playing the role of the arrogant and selfish Beast was a perfect choice. His dramatic haunting voice and pantomimic gestures was very effective. From the Father down to the whole ensemble, this musical was a gathering of stellar cast of what REP has to offer. The clarity and accent consistency in the delivery was purely heaven. A must see musical for all ages. Alternating in the role of (Beauty) are Cara Barredo, Alana Vicente, Maya Encila and Jill Ita-as. (Beast) Arnel Carrion, Jos Jalbuena, George Schulze and Hans Eckstein. (Father) Robert Encila, Onyl Torres and Oliver Usison. (Ensemble) Ayam Eckstein, Naths Everett, Abi Sulit, Arion Sanchez, George Schulze, Steven Hotchkiss, Chino Veguillas, Vien King, Ina Salonga, Alex Duffy, Nikki Herrera, Moira Lozada, Charlie Barredo, Gold Soon, Nicky Trivino, Camille Velicaria, Aixia Mallary, Aly Wijangco, Sweet Buchanan, Trish Ocampo, Jom Logdat, Ring Antonio, Janine Tolentino, Moira Ostrea, Czar Decena, Mano Domingo, Joshua Cabiladas, Matthew Barbers, Dingdong Rosales, Daniel Delgado, Edu Briones, Dave Corpin, Dwight Vito Cruz, Luigi Quesada, Silver Rose, Jacqui Jacinto and Joni Galeste. 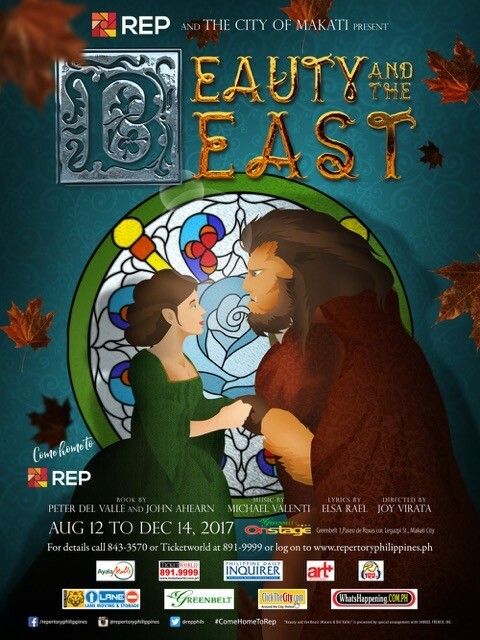 The beauty and enchantment is playing until December 14, 2017 at the Onstage Theater situated in Greenbelt 1, Makati City. Call REPertory Philippines at 843-3570 or Ticketworld at 891-9999 for ticket reservations and purchases. Log on to www.ticketworld.com.ph. For the current and upcoming season visit www.repertoryphilippines.ph and follow repertoryphilippines on Facebook and Instagram and @repphils on Twitter.